Its one of the biggest fitness band battles – the Fitbit Charge hr vs Jawbone Up3 – and today we’re going to dive into which band makes the most sense for which type of user. Lets dive in. In 2011 FitBit released their Ultra and Jawbone released their first generation UP, and in a heart beat the genre of wearable technology was born. These two are the oldest rivalry in wearable technology, and fast forward nearly five years and both remain at the pinnacle of the activity tracker market. The trajectories of the two companies have diverged, with Fitbit arguably becoming the poster boys for the upstart start-up who are taking on the emerging yet old-school manufacturer giants who are coming to play in their field. It is Fitbit and their range of higher spec smart watches and bands who everybody’s comparing to the Apple Sports Watch – reviewed here for runners – and the new breed of Asus devices entering the market. The Asus Vivowatch has already damed the Fitbit surge, yet it is Fitbit who remain at the top of the fit tech charts going into 2016. Jawbone on the other hand, if not the forgotten pioneer of wearable tech, are increasingly becoming something akin to that. However, they are still relevant and still have some solid products in market. So lets look at the best of what these two fitness-tech giants can bring to the table – comparing the Fitbit Charge HR and jawbone up3. These devices both represent the flag ship offerings of the respective companies, and whilst both saw some delays in coming to market, both are now fully available and selling well. We’ll look at their respective features and help you choose the best activity tracker for your needs. As you may have assumed, the Charge HR is an upgraded version of its namesake the Charge, with the key addition of wrist based heart rate monitoring. As a result, from a design perspective, this band looks almost identical to its relation. The buckle is manufactured from stainless steel, industrial grade, and adorns an elastomer built bracelet. Its 34mm wide, and can fit a wrist size of 55 inches to 9.1 inches. Colours available include blue, plumb, tangerine and of course, black. It has a small OLED display which provides the most rudimentary of smart watch features, minus the more work-like ones. Our main concern with the Fitbit’s design was that of the band – as an eczema sufferer wit hypo-allergenic requirements, I did suffer from the skin irritation which has plagued this device. Whilst the comfort is beyond question, its actually a lovely feeling material, the discomfort of skin irritation clearly outweighs this. I was left with a pretty unsightly red ring mark where the band had sat, with no ambiguity around the cause. The UP3 on the other hand offers a marginally smaller profile (12.1mm vs 13.4m profile) and has a simplified one size fits all design, so there is no need to go seeking out a more precise size if you’re buying this as a gift. Over 30% of all fitness bands sold have been purchased as a gift, so this is a fair consideration. The size issue with the Jawbone is handled by an adjustable clasp, much like how you deal with a bracelet watch. Much like the Fitbit, the UP3 is available in a raft of colours, with rose gold, indigo and red joining the launch models of silver cross and black diamond. Unlike the Charge HR, I did not get the same skin irritation from the UP3, and a result – somewhat naturally – it won out for me. If you’re not a sufferer of eczema, dermatitis, psoriasis or any other skin condition, then I would likely plump for the Fitbit’s design, but this is a key consideration for skin sufferers. Design verdict: I marginally preferred the look and feel of the Fitbit, but can’t ignore the skin issues. UP3 therefore wins by default. Fitbit charge HR vs Jawbone Up3 – which has the best heart rate monitor? The mergence of fitness bands with heart rate monitoring was a key moment in the evolution of the device – and one which may actually prevent the doomsday prediction that the genre will be dead by 2020. This overnight catapulted the devices into relevancy amongst the gym crowds who don’t necessarily want an interruptive smart watch experience, but do want the continuous heart rate monitoring at a better price point. So which of these devices has the best heart rate monitor? Firstly, a whirlwind intro to the science of heart rate monitoring. Essentially, there are two ways that wearable technology can capture your heart rate. The first is using an ECG grade strap, and the second is using an on-skin sensor. The former is infinitely more accurate by proxy of the method it uses, which basically mimics the way your doctor captures your heart rate. The latter is more practical though, because you don’t need to strap up and as a result can practically collect day round readings. So what we have here is a battle between the need for hyper-accuracy and the desire or a better user experience. We help you make the best choice for you in our help article here, which explains the accuracy of strapless verses strap based HRM readers. The Fitbit Charge HR utilises Fitbit’s upgraded PurePulse technology, which aims to give you a 24/7 view of your heart rate fluctuations. The amount of work that you’re doing (heart rate) gives a much more accurate picture of calorie burn when additional gender/weight/demographic data is added compared to trying to extrapolate this out from mere steps counted – so the feature is very valuable considering the core-use case that many people have for these devices (capturing calorie expenditure to help lose weight). The collection method is the same as with the Fitbit flagship smart watch, but has the wrist based drawbacks. The Jawbone UP3 is built on a different and slightly more sophisticated collection methodology. It has added bioimpedance sensors, as well as skin and ambient temperature sensors to the accelerometer (which is included in the Charge HR), which gives a slightly more rounded picture (IMO). According to Jawbone, this is “the most advanced activity tracker known to man”, which is a big and bold claim which may or may not be BS! However, accuracy wise, I do believe the UP3 has the edge. The readings are a little lower, which is a good thing because these bands typically over-read ridiculously, and I do sense that the additional data points are adding value. Fitbit charge HR vs Jawbone Up3 – which has the best tracking app? The companions software applications which accompany these bits of hardware are one of the biggest touch points. In reality, its often these which differentiate the good from the great trackers, because big data is all well and good, but its only great when the data is actionable. The next big drive with wearable tech is discovering ways to pull actionable insights so that we can make data led interventions. Interventions are when we are able to understand some of what the data is showing us in order to make more informed lifestyle changes. If for example a wearable can tell you when your stressed by reading your cortisol (the stress hormone) through your skin, then it can also tell you that walking the dog helps limit this. So an intervention would be to use the wearable to find the moment of peak stress and then to arrange, where possible, to walk the dog at this peak moment. So which of these devices does the best job of helping us make data based interventions? So, to that point, both of these bands will track your everyday activities, including the basics like steps taken, distance covered, floors climbed and how many minutes of the day that you have been active for. The latter is becoming a really good analytics stat, one which may ultimately prove to be the most important of them all. The notion is, its great if you blast a workout in the morning, but if you are then sat on your backside all day thereafter, then you won’t score that well. It is theorised that the fittest and more importantly – the healthiest folk, are those who have the most active minutes. So its great that both devices help you monitor this. However – both of these deices lack the GPS chip which would transform them [for fitness folks]. GPS chips track your real movement, as in where you go to and where you went there from. This is key for understanding terrain, distance, speed and other such hugely beneficial stats for e.g. runners. So the tracking and thus apps from a runners POV will always be flawed, which is a shame considering the cost/benefit of such chips. The Fitbit wins for real-time stats via its OLED screen, but we prefer the UP3’s mechanism of nudging you to be more active. It also has a sport detection system which beats the Fitbit. On balance, we prefer the Jawbone. These devices are so similarly priced that there’s very little to choose. The Charge HR is £119 to the UP3’s £129. There really is not enough here to impact our decision. 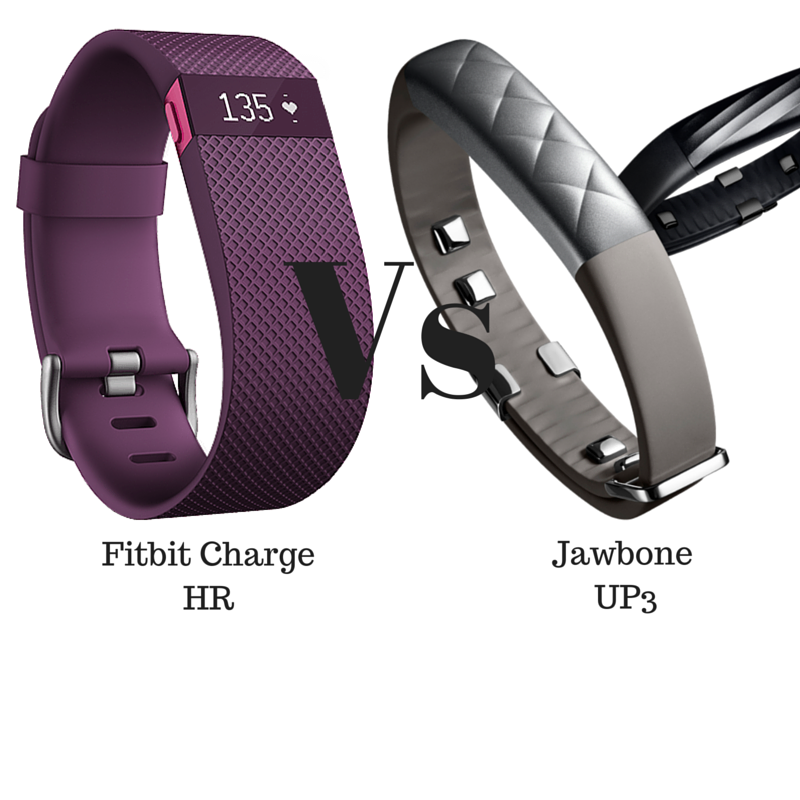 Fitbit Charge HR Vs Jawbone UP3 > which is best? You know what, after this near 2,000 dissection of the two devices, but most importantly after playing with both for 7 days, I am split. In all honesty, and i never come to this conclusion, I think that we have a dead heat here. These two flagships show all of the hallmarks of the progression that both companies have made over the past five years. These products are both evolutionary, having grown with Fitbit and Jawbone as they restively grew this space. I love real time analytics and feedback – its what these devices are all about, and I love the way Fitbit gives it to me without having to use their app. Their OLED screen is great, and when in exercise mode, this does add value. However, I prefer the UP3 visually and it does not irritate my skin (huge bonus for me, likely a non-issue for you), and its auto sports detection and laziness nudge (!) is of real benefit. Countless times this week it has spurred me into taking a little wander after being seated too long, and thats likely to have a great impact on my health and my productivity. For me, I’ll be keeping the Jawbone UP3, but I wouldn’t argue with you if you choose the Fitbit Charge HR. It really is a toss up. Previous articleSmart Watch Or Fitness band? Did Black friday Just Reveal That Retailers Think The Band Is Dead?